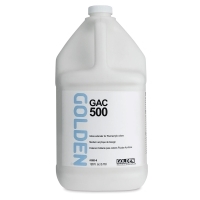 GAC 500: Acrylic Polymer for Self-Leveling Applications — Adds a self-leveling working quality, and dries to a high gloss with good transparency. 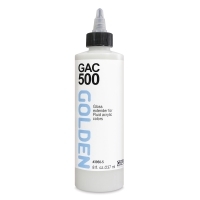 Increases mar resistance, and decreasing dry film tack. 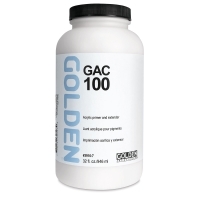 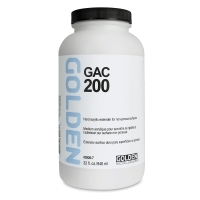 GAC 200: Acrylic Polymer for Increasing Film Hardness — The hardest and least flexible polymer. Mix with acrylic paints to increase film hardness and reduce dry film tack. Useful for adhering acrylic paints to nonporous surfaces such as glass or plastic. 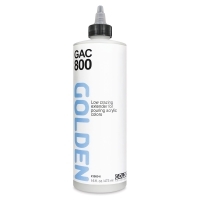 Dries to a clear, gloss finish. GAC 800: Acrylic Polymer for Reducing Craze — Use when puddles must dry with the same evenness and smoothness as when wet. 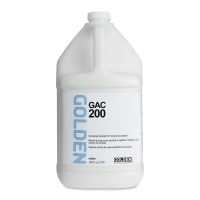 Other GAC polymers will "craze" when drying, developing shrinkage crevices across the surface. 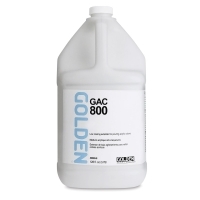 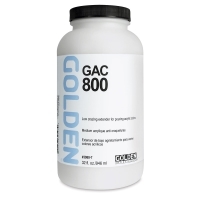 GAC 800 dries with good gloss and flexibility but with moderate clarity. Also ideal for priming chalky surfaces.